After releasing a list of nominees last week, the Georgia Film Critics Association (GAFCA) has released winners for the 2017 GAFCA Awards. 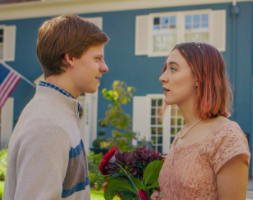 “Lady Bird” was designated as Best Picture, taking home four awards in total: Best Picture, Best Director (Greta Gerwig), Best Actress (Saoirse Ronan) and Best Supporting Actress (Laurie Metcalf). Jordan Peele won Best Original Screenplay for “Get Out” and the Breakthrough Award. Daniel Kaluuya won Best Actor for the film. Other multiple award winning films include “Coco” (Best Animated Film and Best Original Song) and “Dunkirk” (Best Cinematography and Best Score). Edgar Wright’s “Baby Driver” won the Oglethorpe Award for Excellence in Georgia Cinema. A shortlist of other films up for the prize will be released soon. Founded in 2011, this year marks the 7th annual awards program for the critics group. GAFCA is made up of 26 film critics from around the state, representing print, television, radio and online media. For more information on the Georgia Film Critics Association, visit www.georgiafilmcritics.org. “Baby Driver” – Edgar Wright.